For the first time in about 8 years…. I did a craft! Notice the excitement in my tone? That’s right, I, the most unsuccessful, least crafty mom you will ever meet, did a craft! AND, not just one craft, but 3! Now, this may not seem like a big deal to most mommies. In fact, it’s pretty common within the mommy-community. But like I said before, I have never been your typical SAHM mom. Even when I was a SAHM with just two kids, the most I ever did was decorate cookies, and they were usually the Pillsbury ones that are already cut out with the frosting that looks like toothpaste (I cringe as I actually admit to that). And I’m pretty genetically inclined to be crafty. My mom was the macrame queen (yes, I grew up in the 70’s) and my sister could scrapbook and sew dresses in her sleep. 1. It’s OK if you don’t get it right the first time. Just like anything there is a learning curve. While some things come very easy to me (I can cook up a gourmet meal like nobody’s business using only ingredients that I have on-hand and never need a recipe), it is just fine if I struggle with a few things here and there. 2. I am creative. Maybe I’m not the mom the creates the fun things that go on Pinterest, but I can adapt anything to fit my personality and lifestyle. And that still makes me feel like I have a teeny-tiny creative bone within me. 3. I’m not, have never been, or ever will be the mom who can make a memory book, darn a sock, til the garden, and make a pot roast from scratch all before the kids get home from school. Working outside the home gives me a little more of an excuse, but even when I was a SAHM, I didn’t do those things. I’ve learned to accept it and focus on my positive mommy/wifey skills. Besides, I can wear 3″ heels to a field trip and still keep up with twenty 12-year-olds with no problem! 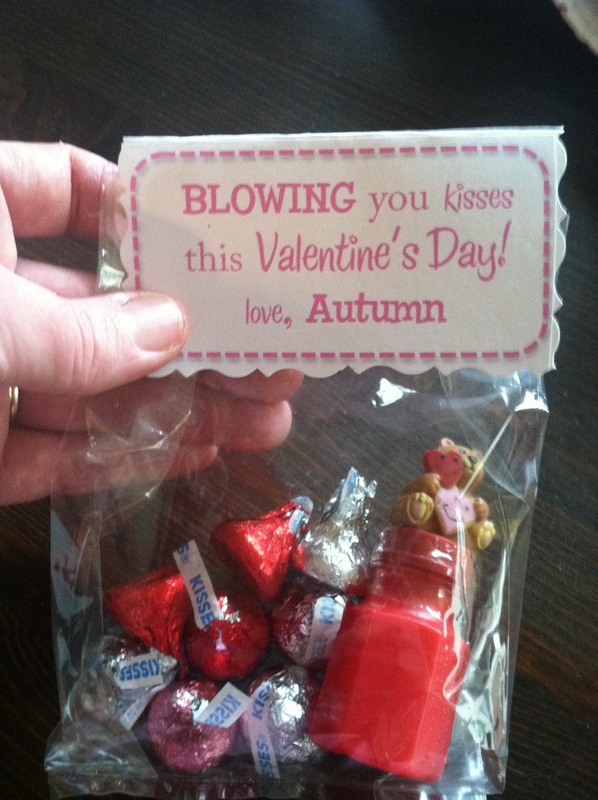 These are the Valentines that Autumn chose to make for her class party.